Are you searching for a trusted interstate removalist to move from Canberra to Melbourne? Don’t look further; we have helped hundreds of Australian families relocate successfully from Canberra to Melbourne. Moving interstate is a great way to explore a new area, meet new people and embrace a new environment. Often, people worry at the thought of moving because it presents a task that might be difficult to complete. At , our business helps people move interstate in Australia without the difficulties. Our removalists are equipped with the tools, equipment, skills and experience to successfully move your belongings, no matter the size or quantity, from one place to another. As you prepare to move from Canberra to Melbourne for work, business, family or retirement reasons, it is important you plan your move. Many people neglect planning until the last moment because they feel it is a task that will take care of itself. Unfortunately, preparing to move your belongings does require time and effort on your part. To help you with this process, we can help pack, transport and unpack your belongings with the professional service you need. To help you move from Canberra to your new home or business in Melbourne, we have prepared responses to frequently asked questions below. If you have any other questions, feel free to contact us so we can help you prepare well for your interstate move. Preparing to move requires time, patience, and research. Once you have settled where you are going to move, there are plenty of other things to consider. Among work arrangements, schooling for your children, accessibility to shops, connecting utilities and more, you will need to ensure that you arrange an interstate removalist to collect your belongings and transport them to your new home or business. You will need to consider when you want the move to take place, what you will be moving and how you will go about completing the move. At Dawson Moving & Storage, we understand what is required to move successfully and we can advise you on all the things you should consider. We offer many services that we can tailor to suit your needs and requirements. Can I Move Large and Bulky Items? We have the tools, equipment and know-how to move large and bulky items safely with care. Whether you have a grand piano, snooker table, grandfather clock, antique furniture, chandelier, wall art, sculpture, monument, water feature, or some other big item, we can move it from any location without difficulty. Whether we pack the entire item or dismantle it carefully ready for transit, your precious belonging will be transported correctly to preserve its integrity. How Will I Sort Through All The Boxes and Crates? It is only when you move do you realise how much you have! As time goes by, the little things you accumulate can turn into a large pile of precious memories. Before you start packing, remember to label your belongings and keep them organised. By placing similar items together, items from a draw or cupboard into the same box or items from a particular room in similar boxes, you will be able to find the items you need without spending unnecessary time and effort searching for it. We can also help you pack and unpack your items. Our staff are trained to handle your belongings with care so that you can feel comforted knowing your items will not be damaged or misplaced. With your instructions, we can also place your items where you like so you can spend your time dealing with other matters. How Many Trips Will You Make? We try our best to minimise the number of trips we make between your old place and your new place. Depending on the size of the truck and the number of items you have, we will assess how many trips are required. We also ensure that we do not overfill the truck with your belongings so that we can prevent any damage to your items. I Don’t Have A Toolset to Dismantle My Furniture? Not to worry! The removalists at Dawson Moving & Storage can help you dismantle your furniture and pack them accordingly. Once you arrive at your new place, the team can also help you reassemble the item. With the experience of helping many customers with interstate removal, our team will know how to efficiently dismantle and reassemble your possession without causing delay and any unnecessary damage. Protecting your goods in the event of loss, damage, theft or other reasons is wise. Insurance can help you in time of need when things go wrong. We can help you select appropriate and adequate insurance cover depending on your move. While it is an upfront cost, it gives you peace of mind knowing financial assistance is available if something happens against your interests. I Live in An Apartment Building. Can You Help Me Move Out? We can help you move if you live in a unit or apartment building. No matter how high up you are, we have the equipment to help you successfully remove your items so that it can be transported to your destination. It is important to consider any applicable Owners’ Corporation rules that might apply to your moving items in lifts or using the staircase. Remember to check with the committee and seek their approval before transporting items, especially those that are large and bulky. You might have to follow specific procedures. I Live in A Remote Area in Canberra. Can You Help Me? No matter where you live in Canberra, we can help you move to Melbourne. Our team of professionals understand Canberra and will be able to locate you and service your area. Our fleet of vehicles are equipped with the latest tools and equipment to help you move all your items no matter where you live. We try to make your move easy, so you can focus on establishing yourself at your new place while we take care of the removal, transportation and delivery. What Other Services Do You Offer in Addition to Removal and Transportation? We offer a range of additional services including packing and sorting, heavy item transportation, pet transfers, vehicle transportation, house cleaning, unpacking services, backloading, antique moving, storage and more. Whether you are moving your home or business, we also provide specialist services to transfer your items such as piano removal, IT moving, warehousing, fit-out services and more. If you need further information about these services, our website contains detailed information about all our services. Yes we are! We are proud to be accredited by the Australian Furniture Removers Association (AFRA). AFRA is the official body of removal experts that helps regulate our industry. We align to their values and codes of conduct to ensure we deliver best practice services for our customers. We would not be an interstate removalist if we did not supply packing materials! From tape, to boxes and to labels, we stock everything you need to effectively pack your items ready for transit. You can purchase your items directly from our online shop or we can bring them to you. If you would like us to do the packing, we can also help you out with that too. I Need to Move in A Few Days’ Time. Is This Sufficient Notice? Of course. We have a strong team of removalists who are ready to help you with your move. We have plenty of trucks, equipment and tools for our removalists to use, so you will receive great service from our well-equipped team. If we are unable to satisfy your requests, we will try our best to fit you in the best we can. What Happens If I Cannot Move To My New Place? Is Temporary Storage Available? Definitely. We can place your belongings in temporary storage to help you transition to your new place without any pressure. We understand your circumstances might change and we can easily adapt to suit your needs. We partner with reputable and secure storage companies to help our customers access the best storage facilities available. Whether you are after container or warehouse storage, we can offer you various sizes of storage space depending on your needs. Locate an interstate removalist and discuss your needs with them. You should consider their experience, access to tools and equipment, services, cost, reputation, accreditation and reviews. If you need to discuss the services in greater detail, give them a call to help you make your decision. Don’t feel daunted by the prospect of moving interstate. Engage a professional interstate removalist that provides a comprehensive package. 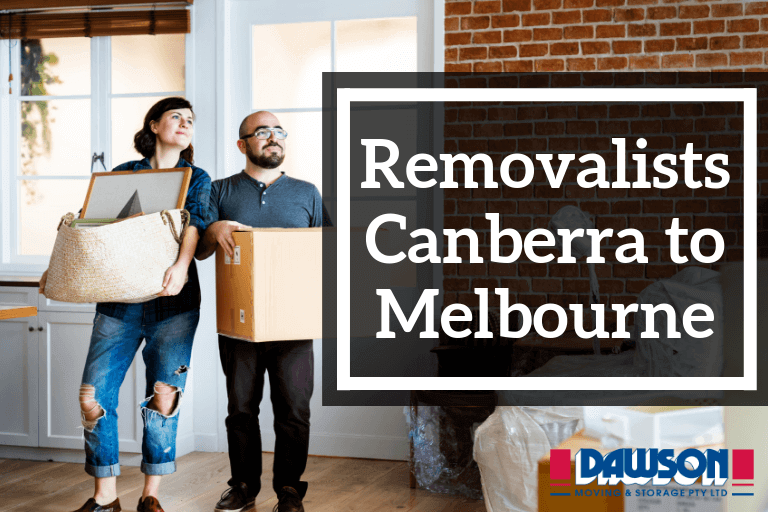 At Dawson Moving and Storage, we understand the importance of a timely, safe and comprehensive move from Canberra to Melbourne. With reliable trucks, plenty equipment, trained staff and years of experience, we will help you worry less about interstate removal so that you can focus on other things that matter. Call us on 1800 066 846 or request a quote online.